BRISBANE’S VERY OWN L.A. LOUNGE BAR IS HERE. Mr. Mista is an L.A. inspired cocktail bar & Asian influenced kitchen that caters for people who love an elegant dining experience but, can still party ‘til 3am. We cater to functions from small groups who just need a booth or tables right up to the full venue experience of around 200 people. Come experience immaculate service, amazing food, delicious cocktail and an LA vibe that’s sophistication redefined. Download our functions package below for details regarding our spaces, capacity and food and drink packages. Large group and exclusive use functions are arranged and priced on an individual basis with consultation with our functions and management team. 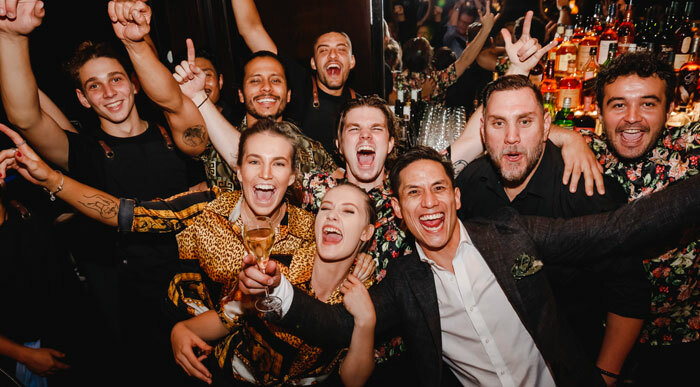 Take your guests to LA for the night and leave a lasting impression with Brisbane’s very own LA Lounge Bar function venue. For every kind of milestone celebration, escape Brisbane for your birthday party and enjoy amazing food, cocktails and a epic decor. Tis’ the season! Celebrate your office Christmas party in unquestionable style with a corporate function venue that will be remembered. Enjoy an evening in one of our elevated booths. Champagne? Well in this booth there’s only one answer: Yes boss. This L.A. style lounge centred in the middle of the venue is perfect for a more ‘relaxed’ occasion. Hence the “massage” lounge… get it? Our private VIP area is elevated even higher than our booths. You’ll love this VIP boothing… longtime. If you’ve got a lot of friends and you want to party, we’ve got you covered for a couple hundred mates.